The training of men who planned on giving service to a lord as a knight. Often a young boy would be sent to foster and serve as a page in the household of a lord. After years of training, the older boy would become a squire and serve a knight who began his training in earnest. When the young man proved his ability to serve he would be granted knighthood in a sacred ritual. The ritual began with fasting and a Night Vigil in the Chapel of a Castle or a Church. During his last night as a Squire he prepared for the vigil by ritual bathing – the body needed to be thoroughly cleansed as a symbol of purification. The Knight wore a white vesture to symbolize purity covered by a red robe which symbolized nobility His shoes and hose were black which symbolized death A sword and shield was placed on the altar. The Knight knelt or stood at the Chapel altar, in silent prayer, for ten hours. 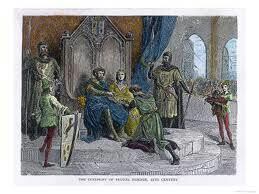 Knighthood was conferred in the adoubement ceremony, or the accolade. In the morning he was joined by others to hear Mass and a lengthy sermon on the duties of a knight A sponsor took possession of the sword and shield which had been blessed by the priest. The sword and shield was passed to the lord who was to conduct the knighthood ceremony. The Knight was presented to the lord by two sponsors in a Public ceremony. The vassal would appear before the lord bareheaded and without and weapons. The vassal would then kneel before the lord, clasping his hands as in prayer which he would stretch outward towards his lord. This position signified total submission. The lord would then take the hands of the vassal and announce his acceptance. The lord presented the sword & shield and ‘Dubbed’ the squire who was pronounced a Knight when the lord would say, “I dub thee Sir Knight.” ‘Dubbing’ was a blow struck with the flat of the hand or the side of the sword and was regarded as an essential act of the knighting ceremony The sponsors then put spurs on the knight and hung his sword. At the end of the Knighthood ceremony a Knight could claim the title “Sir.” The Knights Shield displayed an heraldic blazon which identified the Knight. The Shield and Spurs were symbols of Knighthood. A disgraced Knight had his spurs hacked off and his shield was hung upside down as a sign of dishonor.